PG in BC is up and down. Most bottles promise a lot, the fruit, the blossoms, the herbs. And then in the end some soar, others tread water. We bought this bottle as a novelty, based on a recommendation to try a First Nations venture near Kelowna; it was just a one off and I forgot about it and then I drank it and I thought wow, how satisfying. Jason Parkes, another novelty in BC wines (songwriter, musician, vintner of all things, and award winning in each) had his hand in the pie. I think I will put aside all qualifications on this wine. It’s not my current favorite BC PG, it’s not my favorite PG period, but we started this blog to highlight value, and to call out overpriced plonk and ludicrous reviews that are divorced from the average drinker and this bottle is all about value: decent wine at an affordable price. Six for the patio, and that’s just July. Market Liquidity: You can do better, but at twice the price, and this is better than half the value of those twice as much. I avoid Le Vieux Pin. Our reviews have always been muted by the price point and the presentation as though there is something better in the bottle than you might imagine. It rubs me as precious and then, sometimes, preposterous. We wrote here, in 2012, that LVP “pretends to produce wines that are much better than they really are.” This un-objective bent has led us to, in general, avoid LVP’s boutique kin La Stella which has (I think) the habit of tourist tchotchke kitsch in naming their varietals as if they were kittens. Vivace for Pinot Grigio. Fortissimo for, oh Jesus it’s hard enough to read a German wine label or remember the few hundred Italian varietals let alone these inane nicknames. It’s tiresome. The beauty of the new world is you buy Semillon, not Bordeaux Blanc. But it’s also time to bury the hatchet with LVP/La Stella on this lovely sipper, as the days are longer and the temps are higher and this speaks to everything you might want in a rosé but with actual character. Lovely layers of fleshy fruit and blossom lightness, a meady-y sweetness and a brisk acidity. Refreshing to boot. And, wait for it: An affordable, drinkable, BC sipper. Perfection with an Ottolenghi orzo main. Price: $29 at Everything Wine ($23 at the vineyard). Market Liquidity: A bracing, evocative BC white. Flat out the most interesting white of the spring. And with our crap weather, this was spring refined. Hard to find, hard to figure out in fact, the strange intent of this wine which wavers between something German and something Australian. A gorgeous sipper, with on the one hand a heaviness and on the other something ethereal, which does not infer balance. It’s cryptic. Light, lemon blossoms with heavy, guava undertones; like that, with umpteen more fruit and floral metaphors. I just couldn’t get over it; simple yet perplexing. Loved every drop although it kind of (unexpectedly) fell flat with a basic mac and cheese dinner. If you can source it, source it. Price: Lost the receipt but less than $25. Market Liquidity: We went through a Sea Star tear not too long ago, here and here and here and here, but this would top our list. So far. Probably the best BM PG ever. I don’t know what that means exactly. I’ve always liked their PG, I buy at least six a year, I’ve never been wholesale disappointed, but it’s not bowl you over, ever. Even the reserve, which (was it the 2012?) was stunning and impossible to find following release, is still in the end just an Okanagan PG. However, the base model this year, the wild ferment, really brings the funkiness to the fore. It catches you for a loop. It actually pales in comparison to the Saturna (RIP) wild ferment Riesling, released at the end of the vineyard’s “first incarnation” but it’s still delicious, acidic, pear forward, sharp and a charmer with cheese. Market Liquidity: Easy on the pocket book, golden on the palate. Gismondi had fair praise for this. Floral without too much fruit. 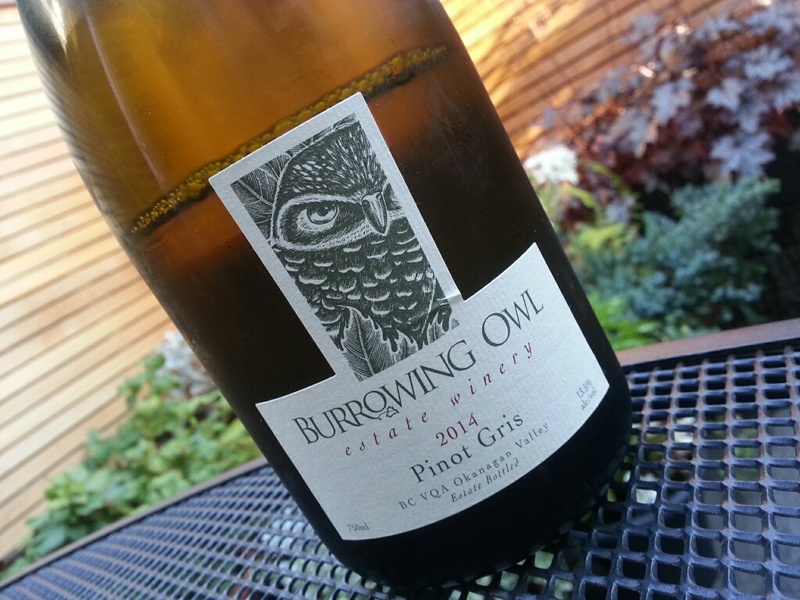 I agree that it’s different than your typical BC Pinot Gris, and interesting at that. But the attack is something of an affront on the palate with an antiseptic jolt that is not as food friendly as you’d expect; he recommended halibut and with the cost of halibut I’d recommend something safer or, if you must go esoteric, an Alsatian Sparr. The finish, well, that’s something to write home about. It lingers on the tongue longer than Barbra Streisand has been in retirement. Gismondi liked the absence of PG’s omnipresent honey, but in the end, you are still stuck with the nectar, although with much more complexity than the run of the mill stuff at BCL. Full points for difference, ho-hum on a repeat buy. Price: $29 or $4 more than the winery at a private YVR shop. Market Liquidity: More a curiosity than captivating. For the past few weeks we’ve been drinking wine we like, rather than new bottles, hence the lack of reviews. For a special occasion last weekend we popped some bubbles including Champagne Nicolas Feuillatte, a “base model” in BC which is dry and appealing with a butterscotch note at the end that, although pales to say, a Perrier-Jouët, is nevertheless delectable. It used to be easy to find, under $60, at BC Liquor, but has for whatever reason disappeared. It was for a while my go-to special occasion champers. We bought a bottle of an Italian red, the Verso Rosso Salenta, which was our favorite value red a while back, review here. What a bomb. Thank god I wasn’t corking it for guests. Hugely disappointing; it had that prune juice funk that leads one to believe it had been stored in a too hot container or left to sit on a loading bay long before it ever got unloaded into a temperature controlled environment. VRS, yah burnt. We finished up some of our case lots from Blue Mountain. Last March I gave, well, a rather savage review of their “regular” Chardonnay. See my disappointment and roundabout way of calling it crap, here. Wait a minute: A year in the “cellar” had transformed this forgettable plonk completely; peach and lemon notes on the palate, opening to reveal an intriguing filbert/maraschino pop that left us no option but to drink it pronto. So, note to self: Order by the case, sock it away for a rainy day. It’s been a few years since we drank Nautilus. It was gifted on a weekend lately and, for better or worse, we opened it with some foodie BLTs on home-made bread. It was a killer. If you think of the “severity” of SB on a ten point scale, with a lot of Sancerre hovering under 3.5, and most NZ SB, like, say Brancott, at an 8.5 or higher, the Nautilus hovers around 7; it has some restraint that’s often missing down under. Bracing but very food friendly. Price: $28.50 before taxes at Everything Wine. Market Liquidity: You pay for the refinement. On an evening of spectacular fresh halibut steamed with baby vegetables in parchment, we opened a Nichol Pinot Gris. (This is not the more expensive, harder to source, “two barrels” PG. But, that said, let’s go apples and apples and hold it up to, say, the eloquent and much loved Blue Mountain base model, to which iy doesn’t stand a ghost of a chance against.) Anyone surfing the blog will know we like our PG, particularly the variety of West Coast PG. The colour of PG in BC, covers a wide swath on the Pantone scale. 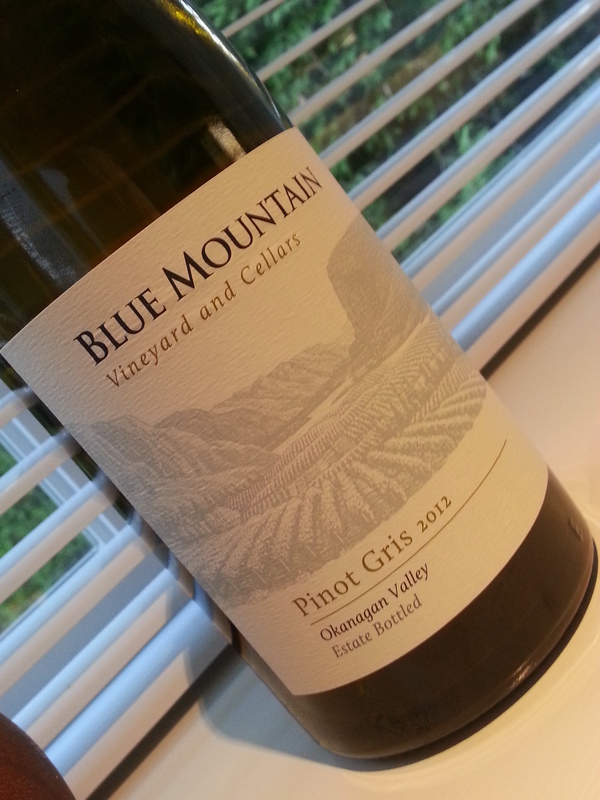 As for Pinot Gris and its myriad hues, I’ll leave that to another blogger, with an interesting take, and a reference to a vintner making seven different types of PG (!) in almost as many colours: Link here. While we’ve “oohed” and “ahhed” about many Nichols in the past—witness us fawning over the Cab Franc here and praising the value of the Nine Mile Red here, (but finding no love for a Gewurtz here,)—this was a tad rough; even if drinking PG is nothing more than the amusement of having a pink hue in your glass, you’re better off with Kettle Valley. Still, it drank well with fish. Market Liquidity: Competition in the marketplace shames this everyday white. The new BM PG is out. A friend sent me an email recently “Don’t you drink anything besides Pinot Gris?” I apologize; it’s a half case here, a half case there. 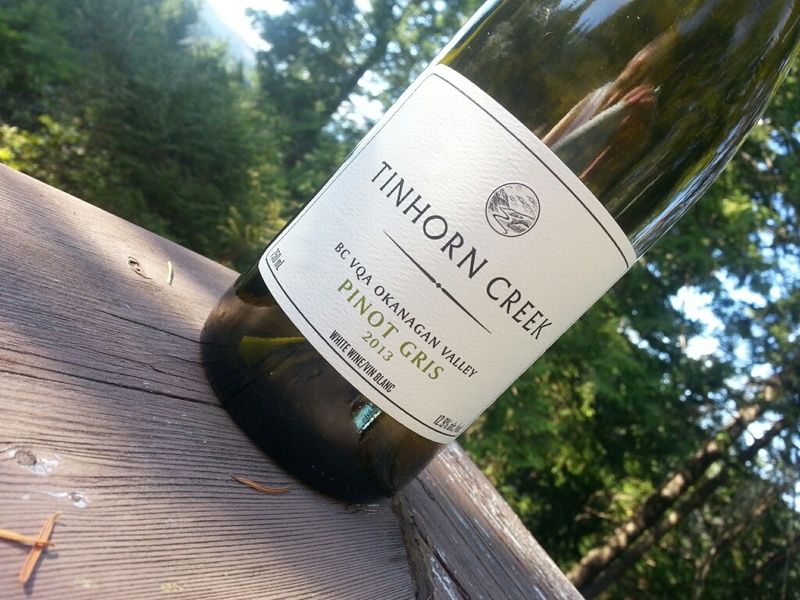 Fun fact: Did you know Pinot Noir, Pinot Gris and Pinot Blanc are all genetic mutations of the same grape? Sorry; this blog is not about wine education! My apologies though for yet one more PG review. I think with the cooler weather we’re closing in on our 2015 allotment. Price: Inexpensive. Period. Kudos to BM. How to explain OK PG? It can be heavy, sweet, cloying, light, ethereal, fruity, flat, dry, nuanced and heavy handed. And in all the many guises it takes on, each has its own merit. We tend towards something more patio friendly than this TC but, nonetheless, it won us over. Yes, it took a couple of glasses to warm up to this lovely OK white, and a few more bottles. In fact, we started drinking this in June and it was August before I noticed it had become our favorite summer sipper of 2015. How do the “pros” determine so much on first glance? You know the dust jacket on Cloud Atlas had very little to do with the complexity of the book; but I digress. Dominant flavours of pear and with a quince-y note, it is deep, masculine and much more rigorous than the average OK PG. Enormously food friendly it had the legs for all sorts of salad, charcuterie and crudités. It is not, however, a pretty wine; it doesn’t warm up or rest on the palate the way the more luxe Burrowing Owl does or the more lean Clos de Soleil does. But, as I say, in the end we bought more. And more. Price: $18.99 from Mud Bay. Market Liquidity: It developed over time. As they say. I’m going to cut to the chase: Not as good as the last time we bothered to review a BO PG; see here. They have pushed the lushness of it a little over the top. But BO is still a heavenly vineyard, both to visit and to reward yourself with a mixed case every now an then. And the price, at $20, well that’s just exactly in our wheelhouse. 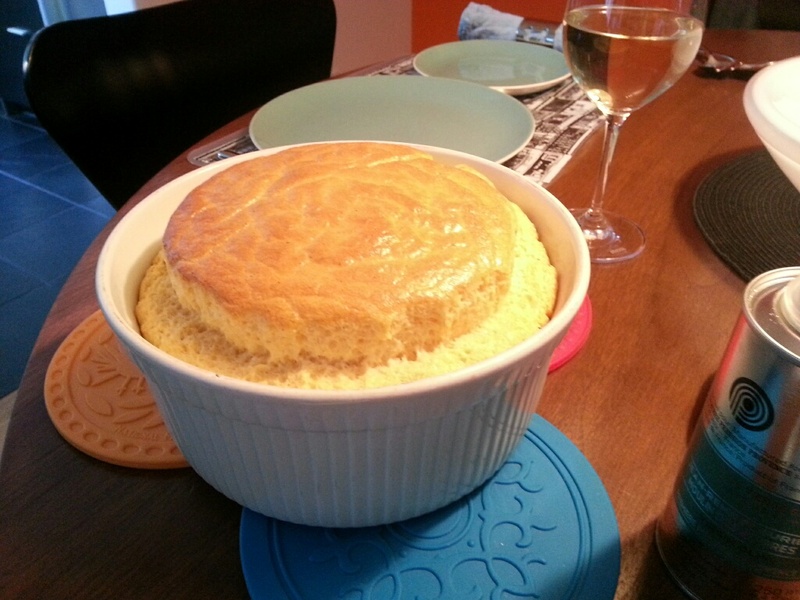 A pretty good match for cheese souffle, but Clos de Soleil Fume Blanc is much better. Price: $20 at the vineyard. Market Liquidity: A tiny bit less residual sugar and it would have been a blockbuster. It could have been the Haywire Switchback PG. Swoon. De-lovely. The silver label Haywire is the Switchback. But the huge disappointment that came with the white label Haywire (sorry, White Label) was a strike against it. Bleach. Here’s our brown-nose review of the Switchback; we rejected and didn’t review the White. Also the Haywire Bub, another one we didn’t review, didn’t impress either. So it wasn’t Haywire. Nor was it the Nichol PG. Which is a wonderful white if we do say so. In the end it was the Blue Mountain PG. 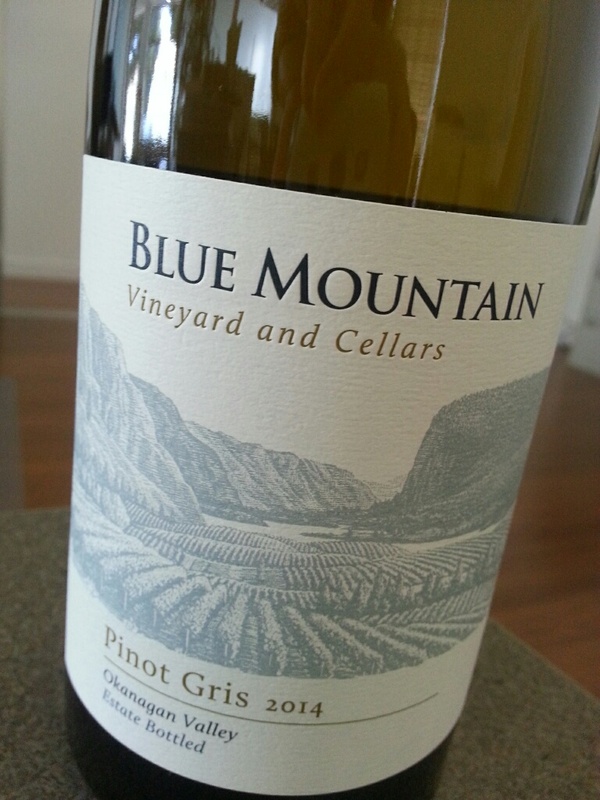 The non-VQA Blue Mountain PG. Vancouver had an atypical long hot lovely summer and nothing drank like home grown PG. Here’s the review.